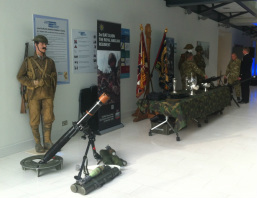 This week the Friends along with Khaki Devil Limited, assisted 3/Royal Anglian Regiment in providing a display at Endeavour House, Ipswich for the signing of Suffolk’s Armed Forces Community Covenant. Designed to strengthen the bonds between military and civilian communities, the £30 million national scheme ensures that funding is available to raise awareness of the role of the armed forces and to assist their relatives and dependants in the local community. The Friends provided two figures dressed in Suffolk Regiment uniforms. One represented a soldier of the 4th Battalion (T.F.) dressed in the uniform and equipment worn by the Battalion during the attack on High Wood, the Somme August 18th, 1916. The other represented a soldier of the 1st Battalion as he would have looked on D-Day, 6th June 1944. Moving forward, Suffolk is to appoint an “Armed Forces Commissioner” to act as a link between the military in the county and local authorities and voluntary organisations. The Commissioner will responsible for leading the work of the covenant in Suffolk. On September 15th at Ipswich, an important Suffolk Regiment medal group will be going under the hammer. The Military Medal, India General Service, General Service Medal with Palestine Bar and Second World War campaign medals to Colour Sergeant Len Jaggard, 1/Suffolk, will be sold by Lockdales coin and medal auctioneers at Martlesham Heath near Ipswich. On 25th November 1944, at the attack on the castle at Geijsteren, on the river Maas in Holland, Private Jaggard was acting as Company Runner. As 1/Suffolk were pinned down in a small wood, Jaggard ran between the Platoon Commanders transferring messages in full view of the enemy. At one point he noticed a company wireless set lying on the road. He immediately picked it up and carried on his errand. His saving of the wireless set ensured that the Company HQ could keep in touch with its platoons. As the wireless was used, Jaggard, no longer needed as runner, assisted in the the dressing of the wounded at the Regimental Aid Post. Later as Company HQ moved position, whilst on the move, the wireless operator fell (believed to have been wounded) and Jaggard picked up the set and continued to carry it for the remainder of the day. It was his total disregard for his own life and his courage and bearing that day that were cited "an inspiration to the rest of the Company." The Battalion Commander, Lieutenant-Colonel R.E. Goodwin, DSO, was by now back in command of the Battalion and had no hesitation in recommending Jaggard for an "Immediate MM," which duly gazetted in December 1944 and was personally presented by Field Marshal B.L. Montgomery in early 1945 (see picture above). Jaggard continued with 1/Suffolk throughout NW Europe and later in Palestine. 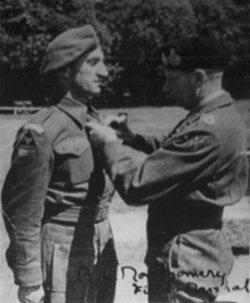 His actions that day epitomise the European campaign of 1944-45 and the true spirit of the Suffolk soldier. Therefore, interest is expected to be high with an estimate of £2000 - £2500 for the group. For those interested in bidding, please visit: www.lockdales.com. We hope that the new owners of Len's Military Medal will truly appreciate it and the deeds performed by him on that day almost 68 years ago. Main Picture: Men of 2/1st Cambridgeshire Regiment pause on a route march through the county, 1915.